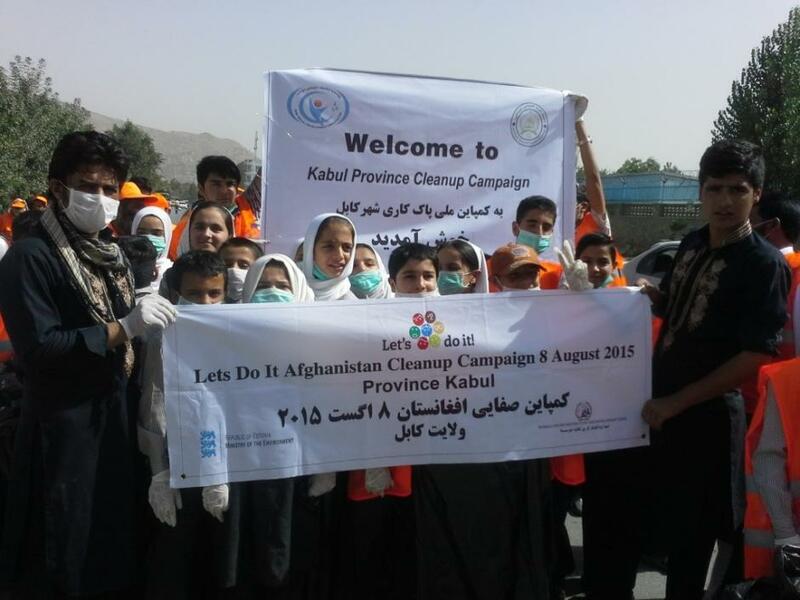 Over 9,000 people took part in a waste clean-up action in Afghanistan recently. The cleanup action was organised in ten provinces, including Kabul, which witnessed three terrifying suicide attacks just a day before. “We had three deadly suicide attacks on 7 August in Kabul, the capital. More than 40 people were killed and around 400 were injured. We are sending all the families our condolences and are with them in our thoughts in this difficult and sad time,” Arifa Mohmand, the Regional coordinator of Let’s Do It! World in Afghanistan, said. During the action that took place in ten provinces, 143 illegal dump sites were located and 102 tons of waste was collected. “The response of the society has been amazing. I think it has provided us a common ground for contributing to the wellbeing of our society,” Mohmand believes. Supported by the Let’s Do It Foundation, based in Estonia, and the Estonian Ministry of Environment, such event was held for the first time in Afghanistan. Khan Agha Dawoodzai, the leader of Let’s Do It! Afghanistan said that the amount of illegal waste in the country is enormous. Dawoodzai conceded that they have thought about several risks and have asked help from the government and various groups who provide help and advice on safety. Even though the risk is high, he believes such action is very important for a country like Afghanistan. “Considering the current context in Afghanistan, it’s important to change the culture of war into a culture of peace. We can do that through active engagement of all the groups to work towards the well-being of society. Such civic actions are the key for providing common ground and partnership for the local population, bringing together the civil society organizations, local municipalities and other groups,” he said. “It is also important in term of educating local people about the role and responsibilities towards our own society. We want to empower local groups to take the lead and get more control of their own life and environment,” he added. The international grass-root network Let’s Do It! aims to solve the illegal dumping problem on a local and global level both short and long term, by engaging a large part of the society in the clean-up activity on an action day, raising the issues related to illegal dumping and engaging both experts, political and local leaders to find more sustainable systemic solutions. The movement began in Estonia in 2008 when 50,000 people came together and cleaned up their entire country in five hours, removing 10,000 tonnes of waste. Today, Let’s Do It! is a global network of 112 countries, having engaged about 13 million participants. Cover photo: Let’s Do it! Afghanistan.